Prayer is central to the season of Lent. The season is framed by the story of Jesus going to the wilderness to fast and pray, where he was tempted. During Lent, many people devote themselves to prayer rhythms, disciplines, and other spiritual practices. Lent becomes a time in our lives to remember to pray and to commit to some intentionality in connecting with God in prayer. But what do we pray for? I always yearn for a more robust personal prayer life. I go through cycles in which I feel better at it than other times, but I continue to struggle with the content and intent of prayer. I was deeply affected by a pastoral experience in which my intention of prayer was challenged by the harsh realities of illness and death. I visited a man in the hospital who was otherwise healthy but had caught a virus and declined rapidly in condition. Shortly after I arrived, I was asked to pray with the family, and we all gathered around the man, who was on a ventilator. We all held hands and began to pray. I remember distinctly wrestling with what I should pray for in such a grim situation. As I asked for healing and wholeness for the man, machines started beeping and dinging. Medical personnel rushed into the room and asked us to leave before I was even able to say Amen. The man had gone into cardiac arrest. He didn’t survive. Standing in the midst of a family devastated, I wrestled with my role and with the role of prayer. Did God not hear us? Were we too late? Does prayer matter? These questions arise in serious situations and mundane alike. How do we pray and what should we expect? A prayer is a precious seed sown in barren land. Its sower casts it forth in hope that it will find root and bear fruit. The barrenness of the field is not understood. The power of the seed is not fully comprehended. Only trust falls with this precious seed onto hard ground, waiting for sun and rain to give it life. The fact is that prayer does matter. It may or may not change our circumstances, but it makes a difference in its power to change us. 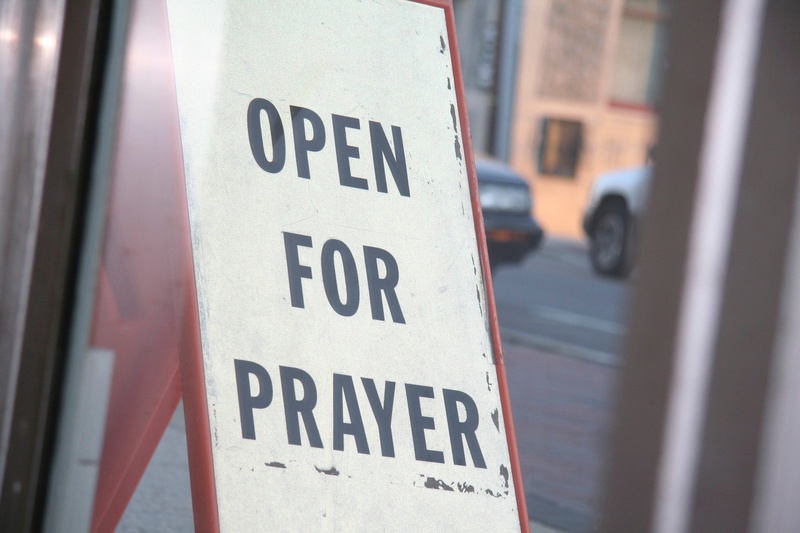 Prayer connects us to God: it puts us in a position and posture of being open to what God is doing in our lives and in the lives of others. Prayer doesn’t become a Christmas wish list of things we want. Do we judge the merit of our prayer, or our relationship with God based on the outcome of our prayers? If this were the case, I would have given up on prayer long ago. Our going to God in prayer exposes our hearts, our laments, our needs, and our desires to the very heart of God. In prayer we connect with God, even if we feel alone and unheard at times. Prayer is about the posture of our lives as we engage with God in vulnerability and authenticity. Prayer can be in silence, in song, and in work. Prayer is a state of seeking to connect with God, which often includes a sense of exasperation, grief, and fear. Yet we persist. In prayer we offer ourselves, who we are in the moment, to God. In our offering we engage in trust—trust that God hears us, that God knows us fully and holds us. This trust is prayer itself. I will always remember the first thing you asked me after we were told Donald did not survive the surgery. You asked me if you could pray and then you asked what I was feeling at that very moment and I said “grateful” grateful for Donald’s life, grateful that I was able to be a part of it, and grateful for the transformative love of God that I was privileged to witness in the last three years of this wonderful man’s life.I may not remember the words you spoke after I said that word but I remember that you gave me permission to lead the direction of the prayer and I will never forget that lesson. Just one among many you have taught me throughout this journey. God Bless you Pastor.